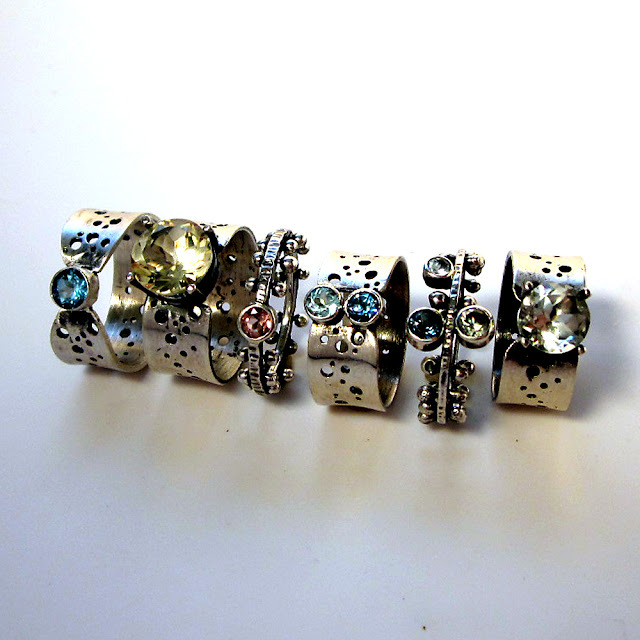 Today I'll be listing some rings in my Etsy store! The light was perfect in my studio this morning, so I took photos. The medieval rings have the barbells through them while the moon rings have the wide bands with holes. L-R: Tapered Moon Ring with London Blue Topaz, Big Bang Moon Ring with Citrine, Medieval Ring with pink tourmaline, Twin Moon Ring with London Blue and Blue Topaz, Medieval Ring with London Blue Topaz, Aquamarine and green Tourmaline, and Big Bang Moon Ring with Prasiolite. Don't forget to use coupon code SAVE20 to get your 20% off a purchase of $50 or more!